Genevieve Taylor - Mexican Pork BurgersThese Mexican Pork Burgers are a perfect example of something you can prepare in advance, then BBQ when you're ready. We’re all about the kinds of easy BBQ recipes that deliver maximum flavour and impact with minimum effort required. 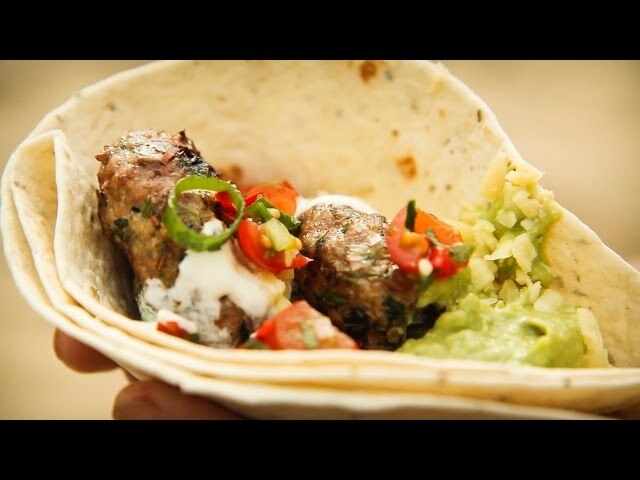 Which is why we love these incredible Mexican Pork Burger Wraps – a simple twist on a classic BBQ pork recipe you can make in advance and simply throw on the grill when needed. Fresh herbs, warming spices and a delicious dollop of guacamole to finish it all off! Tried and tested with adults and kids of all ages, this is one summer BBQ staple that’ll have you coming back for more! 1. Make the pork burgers by tipping the cumin seeds into a small frying pan and toast for a minute or so before putting into a mixing bowl. Add the pork mince, spring onions, coriander, garlic, lime zest, chilli flakes and a little salt and pepper. Mix thoroughly then shape into 8 equal balls, flattening a little into burgers. Pack the burgers, in one or two layers into a plastic tub, drizzling a little olive oil over each to help stop them sticking. Chill until needed – overnight is fine. 2. To make the guacamole, cut the avocados in half, remove the stone and scoop out the flesh into a deep jug. Add the lime juice, garlic, olive oil, chilli sauce to taste and a little salt and pepper. Pulse with a stick blender until smooth then scoop into a tub and chill until needed. You can make this the day before, just press a layer of cling film snugly onto the surface to protect it from discolouring. 3. Make the salsa by mixing together the cherry tomatoes, coriander, spring onions, lime juice, chilli and sugar and pack into a tub. 1. Fire up both sides of the BBQ and leave to heat up for 10 minutes. 2. Use tongs to spread out the pork patties and cook on a high heat for 6-7 minutes on each side – don’t try and turn over too soon as pork burgers can be prone to sticking. Test for turning by raising a little bit of one of the burgers, if it sticks to the grill leave for another minute. As it develops a delicious golden crust it will free itself from the grill. Transfer all 8 patties to one side of the barbecue so that they are positioned over just one burner. Lower the heat of the burner to finish cooking. 3. Meanwhile, place the foil parcel with the tortillas on the other side of the barbecue and reduce the flame of this second burner to minimum. Leave to warm whilst the burgers are cooking, using tongs to turn the parcel over a few times so they warm through evenly. 4. To serve, unwrap the tortillas. Take one and fold it in half, then half again, opening up to create a pocket. Tuck a couple of burgers into the wrap, and top with generous dollops of guacamole and salsa, a sprinkle of cheese and a drizzle of sour cream. Tuck in whilst hot.